I met Tim Anderson last March at the Pittsburgh Home & Garden Show. I was there speaking, and he was demonstrating stone balancing in one of the gardens. He was a far more fascinating addition to the show than I. 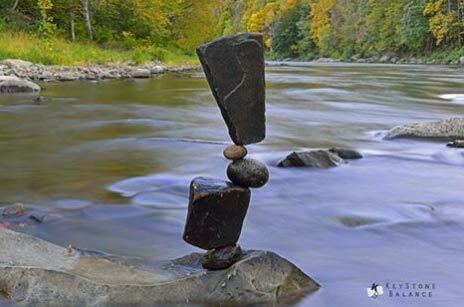 No, the stones aren’t glued, they’re not drilled with metal rods holding them together, they’re balanced. 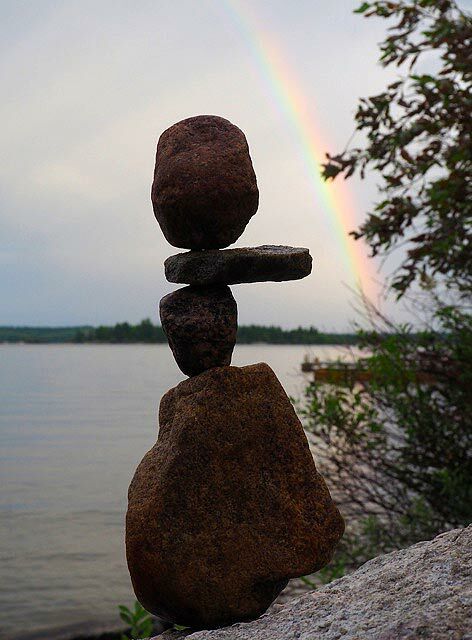 So last summer, while visiting Northwest Ontario, I tried my hand at stone balancing, and immediately fell in love with the art form. It’s a blast, anyone can do it (though getting to Tim’s level will no doubt separate wheat from chaff) and it’s a super neat addition to your landscape. How about some sculptures that will amaze visitors, and then you tell them you’re the artist? All you need is stones. You can start collecting them from your property, find them in the wild (let’s not disrupt too much, however) or head out to a landscape supply yard and buy them. You want a variety of shapes and sizes, the more colorful the better. Collect rounded glacial stones, sharp stones with facets, and plenty of smaller smooth pebbles. Select a stone with a flat bottom that will rest on the ground, or patio table, or edge of the birdbath, without rocking or shifting. Take a second stone and balance it on its end onto this stone. Keep twisting it, moving it, finding a good contact point, then focus in on the balance point, releasing it slowly, gently, until it balances. There. 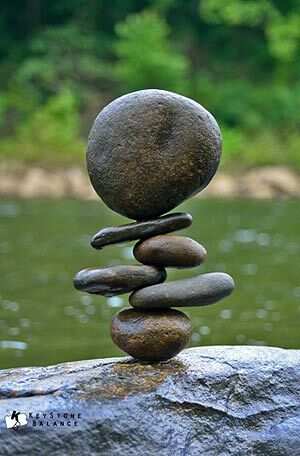 You have just balanced a stone. One of my first balances, a four-stoner, took about fifteen minutes. Now it’s just a case of practice – plus plenty of patience. 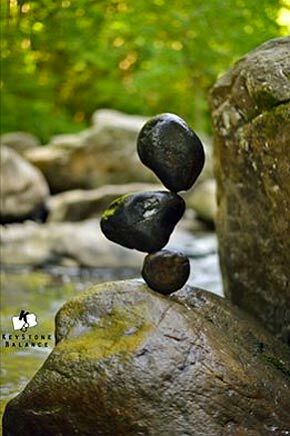 When you’ve balanced a stone on top of another, you hold them together in one hand while balancing the third. As soon as the weight of the new top stone is applied, it will hold the bottom stones together. Sometimes. 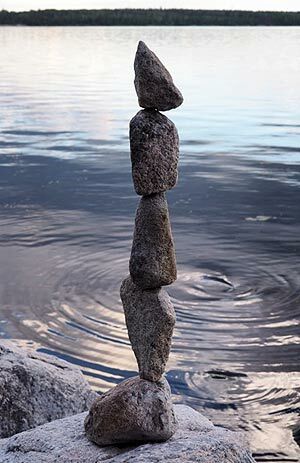 My first five-stone balance, on the shores of Gunn Lake, Ontario. Definitely going for height over form. One loses track of time, but I think it took around an hour. 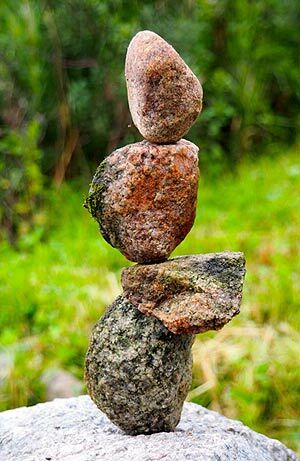 Stone balancing is an amazingly calming, Zen-like activity. After I do some balancing, I feel refreshed, because all you are focusing on is the balance point(s). Your mind clears of everything else. Yes, balances can fall over in the wind, and nearly always in rain, which only adds artistic uniqueness. In your garden, a good, stout balance that doesn’t get too crazy will last a season, if you use larger stones with broad, flat balance points and don’t go too crazy with it. If it does fall over in a storm, you rebalance it. 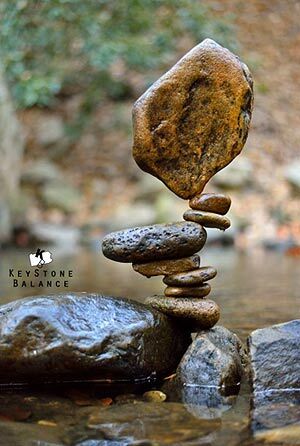 If you decide stone balancing isn’t your thing, it’s still fun to “Like” Tim’s Facebook page, Keystone Balance. You’ll get a beautiful photo of a new balance about once a week, plus Tim lives in the woods near a beautiful trout stream, and is an excellent photographer. He sells prints of his photos in a variety of sizes, all suitable for framing. You can contact Tim via his website, keystonebalance.com. Now we’re back to the Master, Tim Anderson, with a three-stone balance that’s trickier than it looks. Or maybe exactly as tricky as it looks.